Have you ever heard about Royal Azalea..? If not, You have to enjoy the Blooming Royal Azalea in South Korea. Let me tell why you have to..! Royal Azalea has been featured in some Korean Dramas, maybe some of you have seen it. Exploring Korea in the spring is very enjoyable. Spring begins on April and ends in June. In this season Korea transformed into land of a thousand flowers. Sakura begins to blossom on the second and third week of April, then Tulip flowers in late April, followed by Canola flowers in early May, and on the second week of May We can enjoy Royal Azalea. 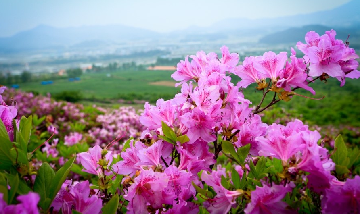 The best place to witness the beauty of the blooming Royal Azalea is in Illimsan mountain located in Jeollanam-do province in the southwest of South Korea. It took about five to six hours from the city of Seoul by bus or train to reach Illimsan mountain. 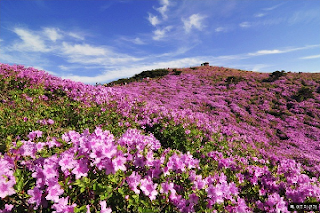 You can also chat with some climbers as you walk all the way to the Illimsan Peak, From the mountain peak you can enjoy Pink Royal Azaleas unfold beautifully around the Illimsan Peak. The weather is so fiercely hot there that makes sweat running down your body, but it will go away all of sudden when you enjoy the beautiful Royal Azalea combined with breezy winds. Everything's suddenly FRESH..!